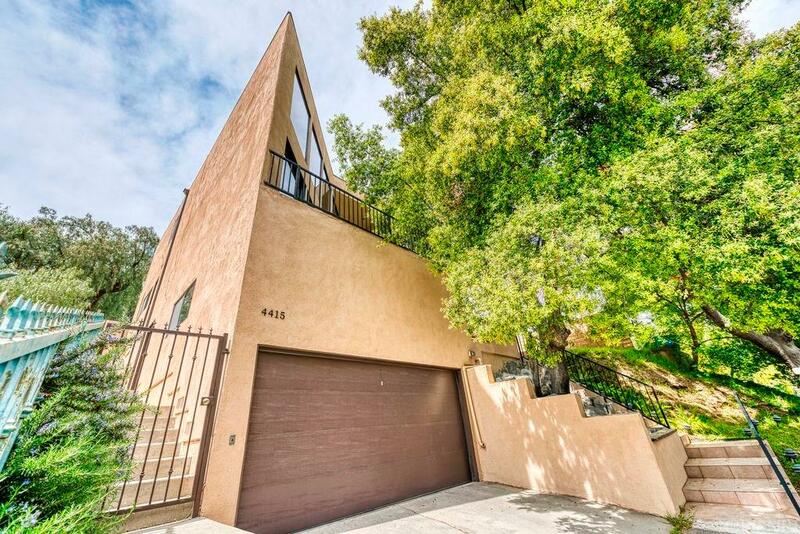 Beautiful 3 bedroom, 2.5 bath homes South of Ventura Blvd. nestled among the huge trees up in the mountains. Enjoy the floor to ceiling windows looking out to the trees and scenery. This home offers 3 big decks with new tile flooring and rails to enjoy, newer stucco, newer block walls, terraced backyard, newer stairs and rails going up to the front door and in the backyard, newer roll up garage door, wood laminate flooring throught the 1st floor and privacy. The kitchen offers granite counter, maple cabinets, double oven, new refrigerator that will stay, ceiling fan, pantry, island and eat in area. The living room boasts floor to ceiling windows to look out into the mountains. The formal dining has room for a large table and china cabinet with a slider to patio. The family room/den has a pot belly stove and wet bar with granite counter. Upstairs offer the master suite with walk-in closet and full bath. All the bedrooms are a great size and have ceiling fans with a slider out to the deck from one bedroom. The upstairs hall bath features granite counter and walk in shower. The backyard is terraced and has block walls all around. There is a big storage space on outside of house.